Site update day! I’ve launched a new look for Ever So Scrumptious, including updated Links – the About Style links now show my absolute, most helpful favorites. Are blogs obsolete, now that the web is moving towards visual media? No – they’re our online salons, where readers stop by for a coallation of intellectual hospitality. These online spaces give us endless possible “haciendas” as described in Formulary for a New Urbanism. With our smartphones, they’re the friends who always have a note for us, wherever we are. This new site theme is more mobile media friendly than my previous one. The new year for me has started out with lots of foundation work. I’ve updated this site; a colleague’s site. I spent a day doing what used to be called “housework” but what I often describe as “infrastructure maintenance” because it is the physical plant for my life as a human being. And I bit the bullet and upgraded some wardrobe essentials. The black leather booties I live in. Black pants. Gray pants. Is anything less exciting than gray pants? Actuarial tables, perhaps – but the gray pants open up 15+ work and play outfits for me. They’re the fairy godmother for my wardrobe orphans. Burlesque and Cabaret – Still emceeing, but I am taking a step back, partly because there’s some marvelous new emceeing talent in Wellington with Victor Victorious and Constance Craving. And this means I can go to more shows! In the audience! Work – My buns off. I’m looking at e-commerce and I’m looking at some intriguing Day Job projects. Travel – My partner and I are going to visit my family and friends in the USA. I’m very excited, even as the budget requirements for this make it a good year to be content with my wardrobe. I also have a super secret project coming up in late March that will involve a bit of travel – more on that closer to the time. Sewing and Writing – I’ve resolved to do more of each. Of both. Of all of them. Life Infrastructure – Big changes under way as my partner and I combine our forces into one residence. We are going to create our hacienda, together. Most excited! We’re starting the future, yet again – whether we like it or not – and this does impact what we wear and how we think about it. And at the start of 2013, change is in the warm and windswept air. Ten years ago “retro” as we know it was happening for everyone. Now the fashion-forward are starting to dress like extras from the last two scenes of Cloud Atlas. Sonmi-451 and her fellow fabricants from Cloud Atlas are on trend with vivid nails, a shot of hair color, and antidepressant beverages. Times are still tough, but instead of “homeland security” our anxiety is Soft Apocalypse-style. Global warming and geological crises are impacting our daily lives. Our diets are changing, slowly but surely. And the madness of governments seems more normal to us, even as we distance ourselves from it by packing our own “go” bags. A half-day reviewing December’s fashion glossies didn’t bring my retinas much retro. Tellingly, the only mag showcasing a retro summer look for us Antipodeans was Redbook. Magazines from the winter side of the world presented go-bag ready styles – sporty, survival-ish quilted puffers and military-style coats are edging out structured wool coats. Huge, sleek totes and doctor’s bag-style satchels are in, one promising the comfort of being able to carry everything, the other giving the bag’s carrier some borrowed intellectual oomph. In blogland, some of my favorite style bloggers are relaxing from high glam into more bohemian looks. Hair is long and ruffled, or in caplike pixie cuts; pendants swing, bib necklaces clank; shoes sprout spikes and defensive excrescences in all directions. Wardrobe Oxygen’s literal wardrobe got totaled by Hurricane Irene in 2011. What New Yorkers wore during Hurricane Sandy is uncannily similar to what Wellingtonians wear, um, most of the time. “When the world goes to hell perfume can help one feel as though things are at least normal,” says Unseen Censer in this post on Perfume for a hurricane after Hurricane Sandy in 2012. NZ designers Cybele and Ricochet have blazed the path here. Free People (free shipping to NZ! ), and Black Milk are in the forefront of this new relaxation. Gudrun Sjoden and Pink Chicken are more modest/sexless-in-that-“quirky!” way manifestations of this. 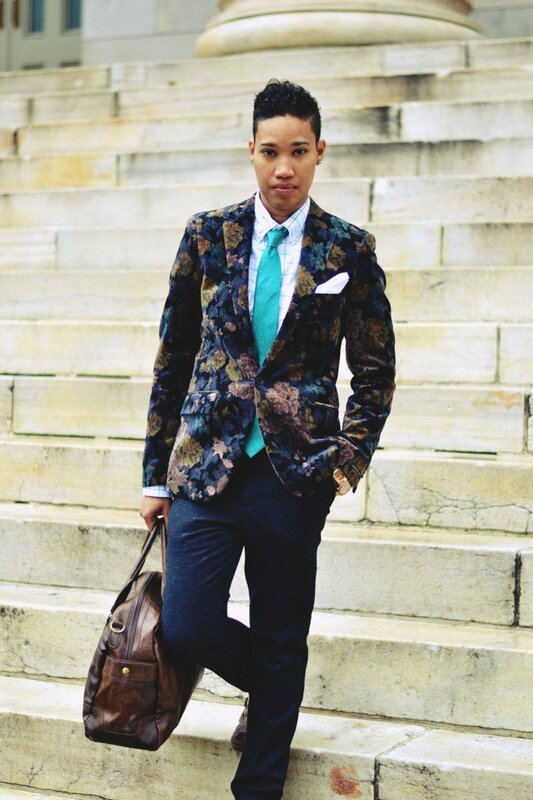 I am impressed with the way style blogger Wardrobe Oxygen makes this look achievable. Stuff in New Zealand has a crisp little summary of 2013 styles that is worth reading if you care about fashion. So, is Miss Retro dead? 1940s to early 1960s style retro is now more accessible than it’s ever been. Makeup, dresses, shoes, instructions, hairdressers, you name it. Rockabilly and pin-up subculture has swelled to the point that we ought to fret about the fine line between “icon” and “clone.” I have a few 50s-influenced looks and finds ready for this year, but I’ve worked to keep away from the standard rockabilly palette of red-blue-black-white. Sometimes with the help of a vat of fabric dye! 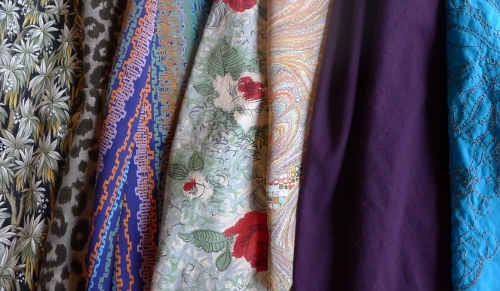 Here’s some of my favorite hues and prints from my wardrobe – some classically retro, some not. Retro flavored fabrics, from the 50s to the 70s. From the left: “cabbage tree” cotton dress, grey leopard print, electric 70s silk, a 50s classic, marbled 70s silk, and the dyed-by-me purple and turquoise hues of full skirts. And I am opening my mind to Ms. Retro, with inspiration from everywhere but the ’50s cocktail lounge. Zippers and velocipede-riding ensembles from the Victorians, embroideries and voiles from the Edwardians, lissom 20s and 30s lines (hi, Giant Pants of the 30s), later 60s and 70s kookiness. I’ve had a preview of BeHome in Miramar – they’re stocking sleeker tunics in linen, in shades of navy, coral, and white that channel the 30s and the late 60s at the same time. Where retro style and the apocalypse meet – besides the 1950s nuclear bunker, of course – is in their rejection of “fashion.” Right now, several of my intelligent friends are formally withdrawing from buying any new clothes in 2013, rejecting fast fashion consumerism. Other intelligent friends have officially (and unexpectedly) declared their allegiance to retro styles, for individual reasons underlined by perplexity at the demands of current styles. Sensing this withdrawal from the artificial fray, some tastemakers declare fashion trends themselves entirely passe. A timely dodge that lets us all concentrate on what suits us best in between the changes of 2013. 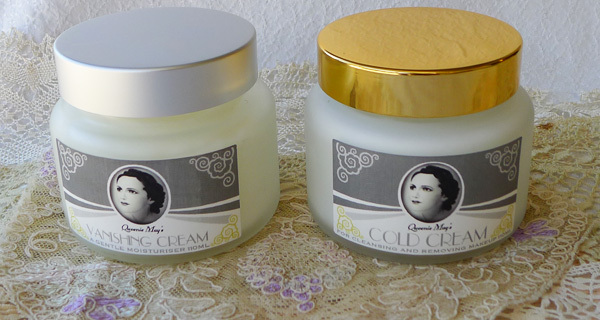 The Product: Queenie May Vanishing Cream and Queenie May Cold Cream. The Challenge: Two nights of emceeing in stage makeup + a busy life had stressed my skin. 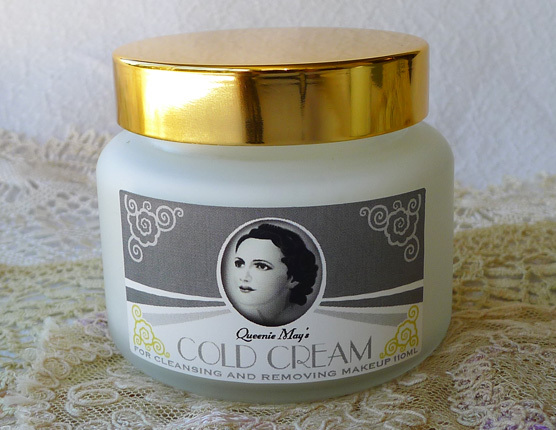 Could the new vintage-themed skin care line Queenie May successfully remove stage makeup after a burlesque show with the Cold Cream, and soothe my battered hide with the Vanishing Cream? 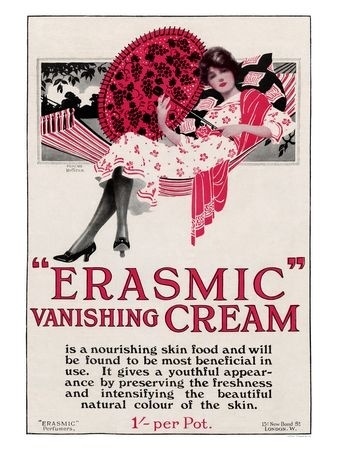 History Distracts Me: What are cold cream and vanishing cream, anyway? My last memory of cold cream was confidently recommending it for Halloween makeup removal in a Bryn Mawr College bathroom in 1991. 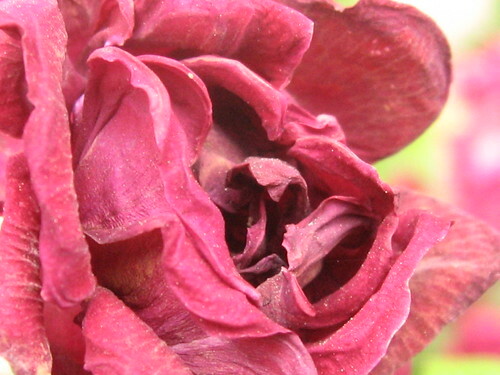 And vanishing cream was, for me, tangled up in the same fuzzy romantic realm as lace curtains and bowls of potpourri. To the Internet! In the dawn of the modern era, when powder was the most a respectable woman ventured, lipstick was required yet unsubtle, and pancake foundation was strange and new, the base color and tone of the complexion were vital to beauty. 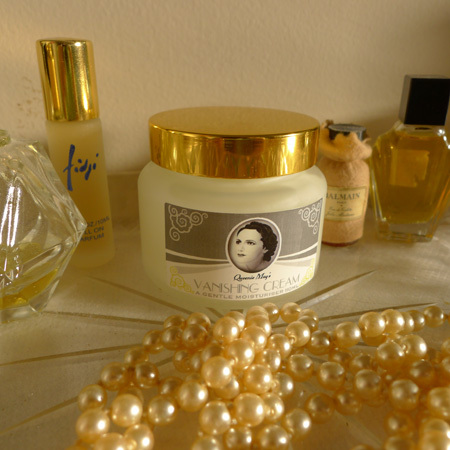 Vanishing creams and cold creams, soft, fragrant, and emollient, had lots of appeal – so much that they were undermined by their own success, as this historical article describes. The literature for Queenie May purrs seductively, “Everything about this cream, the jar, the label, the thick inviting cream, suggests that you take time to indulge in a glamorous night time ritual.” -fans self- Gosh, Queenie, we just met! All-natural, historical, multi-purpose, AND referenced by S.J. Perelman? This, I had to try. There is more to the Queenie May line than frosted glass jars and pretty labels. I’m the kind of person who flips a product over and reads the ingredient list. The creams are 100% botanical, built on olive and jojoba oil extracts, glycerine, and Damascus rose oils. With a nod of approval, I finally opened the jars. Inside the Vanishing Cream is tender and fluffy, and the Cold Cream shows us that it’s aereated. Vanishing Cream to the left, Cold Cream to the right. Note the vivid whiteness of the cold cream – just like it used to be. Saturday afternoon, between shows, I tried the Vanishing Cream on my dry, tired, sad post-show epidermis. It felt rich, but not unpleasantly so, and it did indeed sink in neatly, leaving me soothed and fresh. The slight gloss it left on my skin may be what is described as “dewy.” Four hours later, when I did my stage makeup for a night of emceeing, my makeup came out twice as well as it had the night before. Hm. Any negatives? With the Cold Cream, its one shortcoming as a makeup remover is that it isn’t great for removing modern waterproof mascaras. And while I like the Vanishing Cream in the classic role of a “night cream”, I prefer a lighter pre-makeup moisturizer. Also, I can’t stop putting the Vanishing Cream on my hands. 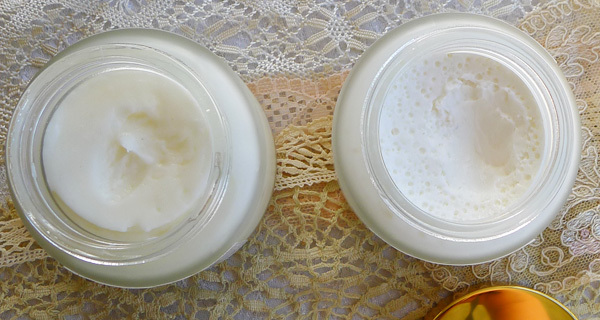 Creams and Oil Cleansing: My skin is naturally oily and prone to breakouts. After trying these oil-based emulsified beauty creams, I braced myself for post-moisturizing zits that…never came. What alchemy was this? It turns out that natural oils are kind to even difficult skin like mine. Oil cleansing has made a comeback as a gentle, surprisingly acne-suppressing method of skin care. Sally at Already Pretty praises oil cleansing here and Crunchy Betty describes the essentials of oil cleansing here. And, oooh, look! The Queenie May ingredients – olive and jojoba oil – are among the recommended oil-cleansing oils. So Queenie May cold cream is basically a single-source, user-friendly oil cleanser. “$40 for all that? That’s really good.” Especially, I noted later, compared to Lush’s Vanishing Cream in its black plastic tub at $42.00. There was one last test. Claire Gormly, proprietress of The Vanity Case and creator of the Queenie May creams, had told me, “The idea is to have jars that you’re proud to put on your retro dresser, to put some of the glamour back into beauty.” Little did she know that I had a glass 1930s dresser set at home. How do the Queenie May jars look in situ? The Queenie May jars are indubitably swanky with my retro dresser items. For aesthetics, I switched the lids on the Cold Cream and Vanishing Cream jars. The Cold Cream is in the bathroom, where I can dispose of the post-cold-creaming cotton pads easily. 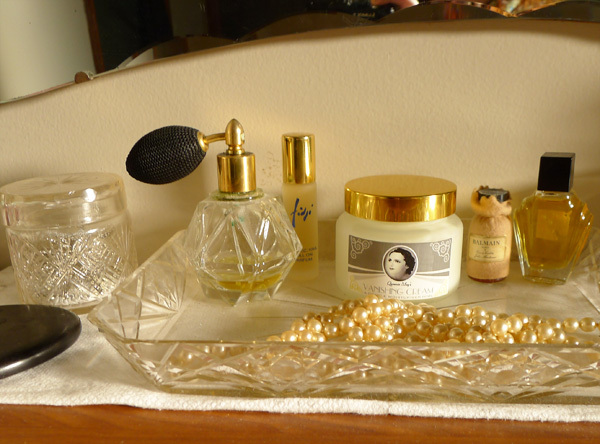 And the Vanishing Cream, the gold lid matching the perfume bottle tops, is tucked on the 1930s crystal dresser tray, waiting for an idle moment. Disclaimer: Queenie May provided samples for my review. Believe me, if I’d gotten zits, you’d know about it. 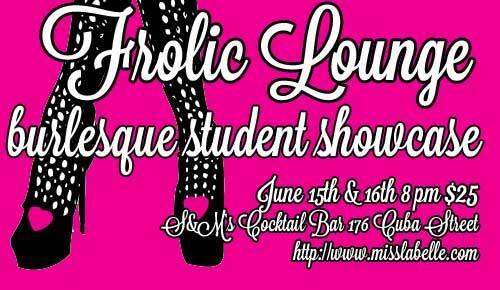 Yes, I’m emceeing another show coming up – Miss LaBelle’s House of Burlesque is bringing back Frolic Lounge. This is…sold out. 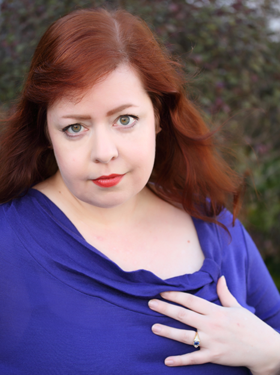 And Miss LaBelle’s next round of classes is fully booked – I believe you can get on a wait list, and that the burlesque name “Zeitgeist Zelda” is still available. Now that I have your attention with that hot pink graphic, go and devour Karen Finley’s poem Black Sheep, then read it aloud to the misfits you love. Then, cheer yourselves up by giving each other makeovers! If ever a blog will change the way you put your outfits together, it is Inside Out Style Blog. Antipodeans, she’s based in Melbourne and doesn’t get too brand-name-y with her recommendations, making her more useful than many style blogs for those of us Down Under. Style at MakerFaire – Parts 1 and 2 – women and men of all ages get their geek on. Digital print fabrics have been impacting fashion over the past several years. Burda’s take on them is inspirational. And, yeah, yeah, mandatory Spoonflower link here. I think these will lead to a serious change in clothing over the next several years. Image from Erzsebet, reused under Creative Commons with appreciation. The strong red lip that came back around 2010 isn’t going anywhere, so let’s discuss red lipstick and its discontents. When red lipstick works, it WORKS. Teeth look whiter, mouths are more succulent, black garments and strong colors become flattering, submitting to the superior red mouth. And when it fails, the fail is traumatically monumental. Often I hear, “I’d like to wear red lipstick but it makes me look like The Joker.” Or Wallis Simpson. Or a strangely older, raddled version of yourself. The Man Repeller has a post on the pros and cons of red lipstick, and how many find it unexpectedly unattractive. Gwyneth Paltrow and Tilda Swinton are two vaunted beauties with fine, narrow lips. Tilda goes lipstickless a lot of the time. When she does go red, a translucent berry red suits her better than a heavy, defined red. Gwyneth sticks to pinks most of the time. 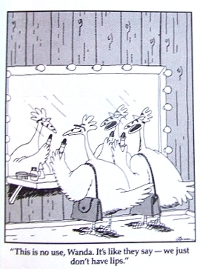 An immortal Far Side cartoon by Gary Larsen. The inspirational red lip of our time belongs to beauty icon Dita Von Teese. And when she doesn’t have her makeup on, you can see how some extra lip seems to get added in there with her makeup. My hypothesis is that she is engaging in some tactical deployment of red lipliner. You don’t have to wear red lipstick, even if you are doing a “retro” look. To be pretty, or to knock a few years off your look, try pink and tawny tones one to three shades lighter than your lip. To be alternative or dramatic, try purple and gold tones. Go matte or glossy if in any lipstick doubt. Frosted tones and sparkle enhance lips’ natural wrinkles. If you want to go red, and you’re new to the look, try a translucent or sheer lip color to get started. If you want an opaque red “retro” mouth, use lip liner first to give your mouth more fullness and to define your cupid’s bow. If you are an Antipodean lipstick novice, I recommend the brand Lipstick Queen. Three reasons: the whole range comes in both newbie-friendly sheer tones (Saint) and full coverage tones (Sinner). The high-quality lipsticks are at independent stands, so you can experiment yourself, without an attendant hovering. And they have a sheer red called “Medieval” that was inspired by the clear blood-red, yet lipstickless, mouths in medieval times, how cool is that? I repeat – red lipstick is optional. You know what I’m about to be into? Purple lipstick! I was asked to wear some purple lipstick at a photo session and that look is fresh – see the image from the session below. Grape Ape is my new beauty icon. Purple lipstick, for a change. This was VERY purple in the tube, I'm amazed at how wearable it is. Have you noticed that overall silhouettes and color trends are the same as last year? That means it’s a good year to be a fashion cheapskate. So, as we transition into autumn and winter here in NZ, I went through my closet and thrifting finds with “Make Do and Mend” in mind. This motto still floats around the collective consciousness after its use in Britain during WWII. After the review, I had three piles; one for the next clothing swap, one for the dry cleaner, and one for repairs. The pile for repairs was dark and gloomy: blacks, brown, gray. New Zealand’s fashion “black out” has come and got me with my wardrobe basics. Seven garments needed repairs or alterations I could do at home: hem repairs, nipping in at the waist, or taking up sleeves/legs. This wasn’t celebrity-level tailoring, but it does make a difference. Most of the garments were pants – what was with all the hem stitch failures? Maybe dance classes last year had something to do with it. Knits didn’t stop me, I take knits up and in with the three-stitch knit/stretch stitch on my Janome sewing machine. And here’s how to take up jeans without losing a special hem. Then, I confronted my raincoat. This coat is a warm, petite-sized, clean-lined raincoat – a valuable Wellington wardrobe component. Unfortunately, last year, I managed to scorch it against a space heater, bending over to scrutinize a drawer full of beaded trim at Three Buckets Full. I was left with an inch-size melted patch besmirching the behind of my coat. DERP. How to fix it? Raincoat behind before: Sad, sad melted polyester. Before: Burned rainproof polyester weave. Raincoat behind after: melted spot is hidden, and what’s not hidden (a small paler area) is no longer the center of attention. A line from a song unites the two birds. After: Say it with me: put a bird on it! The burned spot is hidden under the left sparrow. 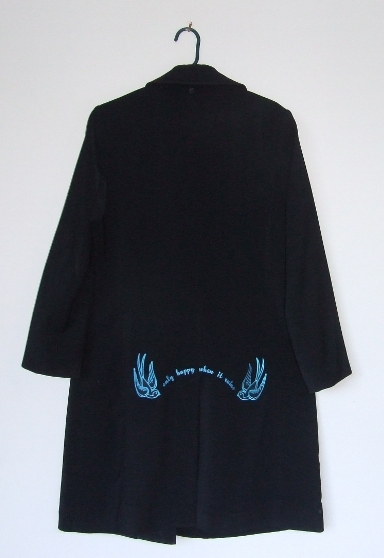 After: Full length back of coat with embroidery and patches. 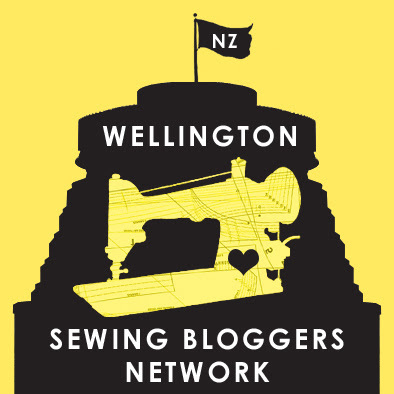 The patches are from Calico Jack’s in Wellington, and the patch hot-fixing and embroidery was done by DKGM in Lower Hutt. They were bemused by this non-sportswear commission and worked with me happily. Nowadays, embroidery places can include up to 12 colors in one embroidered design and have about 200 colors to choose from. So go on and challenge them. One caveat: when a finished garment is embroidered, the embroidery goes through the lining, too. 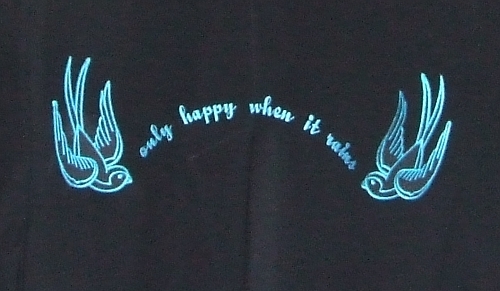 Embroidery through the lining bothered me less than a sad melted spot on my raincoat. Finally, there were shoes. Wellington’s rain really does a number on leather. 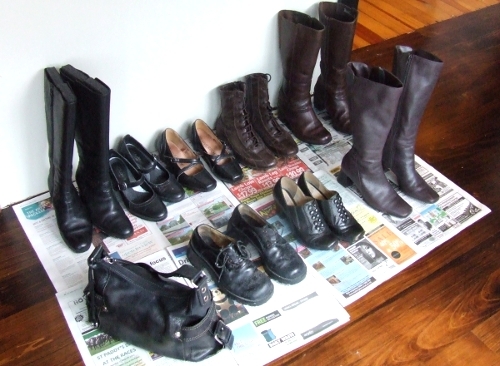 Two pairs went for resoling, and a thrifted pair of ankle boots is lined up to have its heel height reduced. Yes, you can have the heel height on a pair of tall shoes or boots reduced – by about 1 cm. Which isn’t a lot, but it can make a difference. It’s not an expensive fix, either, compared to resoling. I love that handbag to pieces – the perfect size and shape for me, it was a present from my mother. It’s two years old and after a leather dye touch-up and waterproofing, it’s still going strong. 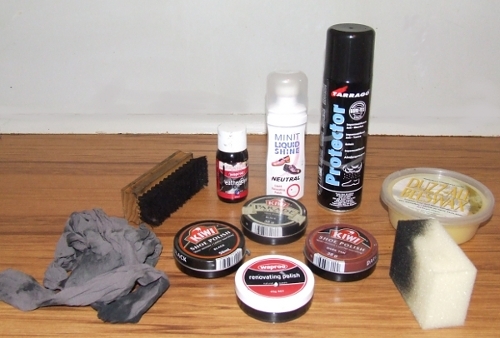 Clockwise from noon: neutral polish, waterproofing spray, beeswax formula, sponge for applying beeswax formula, shoe polishes, a pair of dead pantyhose for buffing, buffing brush, leather dye. Here is a basic polish technique for plain leather shoes and boots. With tall boots, I generally polish them up to the ankle seam, and only touch up the leg area lightly, if required. You can also shine up patent leather and clean suede shoes. Any fashion lover who lives in a humid climate has had the awful experience of taking a leather treasure out of the closet and finding it’s been attacked by mold or mildew. I got lucky this time around – only one pair of shoes needed mildew rescue (the dusty-looking pair with the laces in the photo). My preferred fix is cleaning the mildewed leather with a leather conditioner/cleaner (the same kind used for leather upholstery and sofas). Then I place it in a sunny area for a few days, followed by dye touchup or polishing. Light reconditioning is the last step. Don’t condition items too richly in humid climates – that helps mold grow. Don’t store items in humid areas, and check them every couple of months. If a leather coat has that mildew smell in the lining, you are stuck taking it to the specialist leather cleaner. Now I feel the way we’re all supposed to feel after one of those closet clean-outs – satisfied and reminded of formerly buried favorites. Once those shoes sitting in the sun dry out, I am content. Whether we like it or not, hair is important. At a technical conference recently no less than three acquaintances said to me, “I saw your HAIR and knew it was you.” And my hair isn’t that remarkable. It’s easy to be tempted by dramatic hair transformations. Dyed hair! Pink hair! Retro hair! Perms! And the Interweb is full of sites full of people obsessing about changed, transformed, scuplted hair. When we go to the hairdresser, the magazines are full of extensively sculpted dyed heads of hair. But there are a lot of reasons to take a deep breath, look in the mirror, and consider what you can do with your natural hair. Maybe you’re just paying attention to your hair again after being busy (a geologist friend of mine kept her hair in a braid for field work and got a cut when she returned to university teaching.) Or your formerly-dyed-and-sculpted hair needs a break for a while. Or you want to look good without spending a fortune. I see lots of maximum length Pre-Raphaelite hair amongst my friends who bellydance and enjoy the Society for Creative Anachronism and the like. It draws a lot of attention and admiration. There is a Long Hair Community that discusses every aspect of maximum length long hair in detail. If hair is grown to its maximum length, personally, I prefer it with trimmed ends. If you’re growing your hair out, braid it to sleep, and pin it up to travel or exercise – this helps avoid breakage. Trim it two or three times a year until it gets where you’re going. The transition from Pre-Raphaelite hair or blunt-cut long hair to shaped hair can be intimidating. Some women find that, as their hair changes color or texture, or they change their personal style, they want more structure to their hair. I met an author who had a beautiful shaped haircut that made an impression on me. Then, my hair suddenly got curlier and went into an untamed “pyramid shape” when it got humid. I went shaped to tame this tendency. For your first shaped cut, if your personal style is to wash-and-go (mine is!) tell your hairdresser this. Be firm about length. The more pictures you bring, the better. Grab some of the extra cut-off hair and put it in an envelope in case you want to try a dye later – this hair can be used as a tester. Or for making your own Victorian hair jewelry! You could use jewelry resin and those pendants…but I digress. Once you have your cut, go home, and wash it yourself, don’t panic. I and others have found that it takes a month or two to re-learn our hair after a shaped cut. Curly hair, I’m learning, is different. For “curly girls” of all backgrounds, here is your site with forums, Naturally Curly. In the USA there are specialist salons for long hair and for curly hair. Curly hair salons and curly hair techniques are catching on in Australia and NZ, too. Google “curly salon” in your area and see what’s up. Cold water rinses reduce frizz and increase shine. They cost you nothing except that moment of “augh” in the shower. Sleep on clean pillowcases in a slightly cool room. The pillowcase one is a repeat from the face care post, but it also helps keep your hair cleaner. If you have a fringe/bangs, maintain them. Invest in quality combs. Speert handmade acetate combs are smooth and gentle compared to most regular drugstore combs, and they’re less pricey than the top-line Mason Pearson combs. Try organic/plant-based shampoos and conditioners. Try to avoid lots of blow-drying, and only use a straightener if your hair is thick. Dry shampoo is great. It’s a spray powder that you spray in and comb out of your hair, and by the time you’re done, your hair is less greasy, but you didn’t have to wash it. I find that it works best on hair that has been blow dried, but it’s still worth it on air-dried hair. Batiste has brunette and black hair dry shampoo. Fudge dry shampoo is good for lighter shades & not as scented as Batiste. A simple blow-out (a session with a blow-dryer that either straightens your hair or creates shaped curl) is a good way to look polished. It’s doable at home if you’ve invested in one of those Speert combs, or a flat brush. These instructions are good – you can skip the velcro rollers. The rippling wavy-curl effect we see in magazines and nightclubs comes from that contradictory device, the hair straightener with a curling edge. Sample instructions are here. Be advised that a lot of the time, the hair you see curled and waved in magazines is hair extensions. If you can’t do a thing with that hair straightener or curling iron, the new generation of hot rollers and steam rollers does amazing things with even difficult to curl hair. You can walk out on a hairdresser – I did it once when I felt we were communicating badly. I felt awful, but I did it. Some hair reacts poorly to petroleum derived sodium laureth sulfate in shampoos (it doesn’t cause cancer but it beats up finer hair) and silicone products in conditioners (dimethicone, anything with -methicone as a suffix). Other hair loves silicones. You won’t know until you try, but be warned, some find silicone hair products drying/coating when used over the longer term. Pantene hair products are packed with silicone. And read the ingredients on a lot of those “Moroccan Oil” products being sold right now – a lot of them get more of a punch from silicone products than from argan oil! Some hair also reacts poorly to…dieting. There’s a discussion on this at the Long Hair board. At one point, I lost 15 pounds, and I went to my hairdresser, proud of myself. The hairdresser ignored my body and said, “What have you done to your hair? Have you been sick?” So if you’re restricting your food intake, keep an eye on your nutrition, ensuring that you get enough protein and fat. If you aren’t happy with your hair overall, or you are fighting thinning hair, add a skin-hair-nails vitamin to your routine. All this bossy advice! And most of it is what I’ve gleaned managing my own difficult hair. 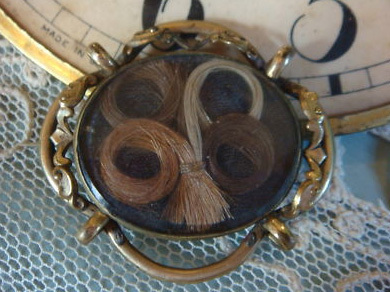 Dear reader, your own hair, I am certain, is lovely. If you want to take it up to the next level of maintenance (coloring, perming, styling), go for it. And if you want give your follicles a chance to shine on their own, I encourage you. Your face is a wonder of biological engineering and neuroprocessing in a dermatologically delicate case. With your face, you see and are seen; you express yourself to the fullest. Even if you never wear a speck of makeup as long as you live, you will carry an air of finish and polish if you take care of your face. 5 minutes of grooming in the morning, 7 minutes of grooming in the evening, and some periodic attention to your brows and eyeglasses will bring you a tremendous return on your time and attention investment. Acquire a pair of clean tweezers and shape your brows. This, alone, will upgrade your entire visage. Ladies, your instructions are here. Fellas, check out this article and this video. Those little stray hairs…you know the ones…pluck or shave them. If you have a fringe/bangs, make sure it’s trimmed. Wear glasses? Keep the frames and lenses exquisitely clean. Evaluate once a year if it’s time to freshen up your look with fresh frames. Inexpensive, stylish glasses are available online now, and I can vouch for their optical quality. Everybody wear sunscreen! Sun damages and ages your skin. I’m sure you know that, but…it takes 1 minute to apply face sunscreen. You deserve that minute. During your day, drink water. Yeah, yeah, you’ve heard that one before, too. But it works. Skin-hair-and-nails vitamins. If things are unsettled dermatologically, or you want an extra boost, try them. Remove all makeup meticulously before you sleep at night. A cotton pad and makeup remover from the grocery store or drugstore are fine. Wash your face with a terry cloth and some face wash (regular bar soap is too harsh). Moisturize around your eyes at least once a day. At night before bed is good. When you lie down to sleep, make sure it’s on clean pillowcases. Think about this: your face is going to be up against that fabric for the next 8 hours. “Facial” treatments. Somebody gave me one for a gift once. It consisted of having 5 different products lavishly applied to my face to a soothing New Age soundtrack. I was supposed to relax. I didn’t do that very well (“what, more moisturizer?”) but I thought a facial was a fine way to try a bunch of products. Your mouth benefits from some specific grooming. Apply lip balm/lip moisturizer once in a while. Check your teeth. Don’t like what you see? For two weeks, floss daily and brush with a serious whitening toothpaste (Pearl Drops, Rembrandt) twice daily. Then, check back. Better? If your gums bleed when you floss, be gentle but continue. Also, eat 1/2 a raw carrot or a raw apple once a day. Both of these are great for your gums. Now your brain and personality have the communicative sensorium-casing they so richly deserve! Go forth unadorned, or apply all the makeup you desire. The end result should be that when someone looks at you, they see…not the extra bristle, not the chapped lips, not the bit of spinach between your incisors…but you. * Just a note to say that if you are a bearded lady by choice, I am all for your choice. Linda Medley’s graphic novel The Castle Waiting has a great bearded lady plot line. We unpacked these beginning statements some more. My friends did not want to be hyper-groomed and obscured under myriad layers of Products, but they did want “more polish.” They wanted to look like themselves, but better. They enjoyed excursions to Goth Castle, the Retro Pinup Malt Shoppe, and the ineffable fashion realms of the 5th Arrondisment and 5th Avenue. But they wanted to read about a livable style ground and femme improvements for every day. Someone whose style is based on wholesome naturalness could take these elements and live happily ever after. Somebody else who wants to become a sleek, groomed avatar of fashion perfection, or a deliciously made-up pin-up, could use them as a foundation. The first post is up immediately following this. That one didn’t take any unpacking (because the box hasn’t arrived yet.) I promise I’ll do that one, too. Flower, Albuquerque, NM. © 2007, 2011, Joseph E. Lake, Jr. Reused under Creative Commons Non-Commercial.